In many respects this is a bold book, first of all because of its premise: a veteran art historian dares, after half a century as an active scholar, to take another look at a classic art-historical problem—the formulation of linear perspective in fifteenth-century Florence. It is perhaps the most classical art-historical problem of all. Fifty years ago, students of art history knew that perspective, the technique of rendering three-dimensional space in two dimensions, first became a sensation in Florence in 1425, when the goldsmith and architect Filippo Brunelleschi invited his fellow citizens to look into a little diorama he had made of their beloved baptistery. When they put their eyes to his peep show, they could hardly believe it when he told them that they were looking at a painted image rather than the real baptistery, nor could they believe it when he presented them with another diorama that showed the city’s main square, Piazza della Signoria; the painted imitation looked just like the real thing (helped along by the silvery mirror-like surface he gave the sky, which therefore reflected real passing clouds). Brunelleschi claimed to have invented the technique that he used to make his flat pictures look three-dimensional, but the patent on that procedure, for all practical purposes, was cornered by another Florentine, Leon Battista Alberti, in 1434 in an essay called Della Pittura, or On Painting. Alberti’s little bombshell of a treatise spelled out, in a Tuscan vernacular aimed at painters as well as scholars, how to construct a perspectival space. Alberti’s essay spread ideas like vanishing points and “legitimate construction”—costruzione legittima—as far and wide as winged words could travel. The subject of perspective has been hotly debated ever since, from every point of view and in every aspect, but the discussions were particularly heated in the twentieth century: did Brunelleschi really invent it, or did the ancient Romans? (They certainly knew how to represent three-dimensional space.) In what did Brunelleschi’s demonstrations consist? (They seem to have been breadbox-sized boxes outfitted with mirrors, but beyond that opinions range widely.) Was the costruzione legittima, Alberti’s method for constructing a perspectival picture, the same method as Brunelleschi’s, or was it slightly different? 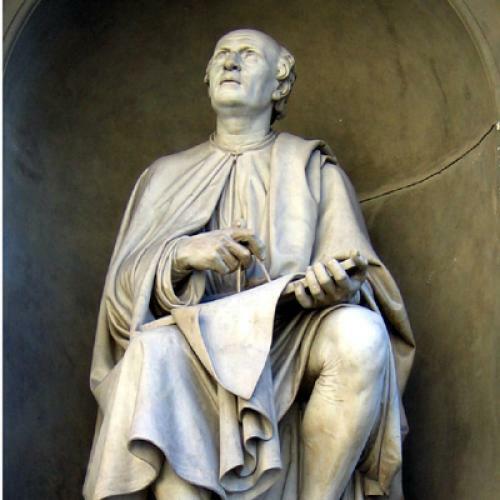 How did Brunelleschi feel about Alberti’s essay, which gave him credit but stole his thunder? Why did perspectival spaces look so real to those fifteenth-century Florentines, and to most of us, and yet look so incomprehensible to other people (as anthropologists were to discover in the twentieth century)? Is our reaction to perspective inborn, or is it learned behavior? HANS BELTING ENTERS the fray with a paradoxical contention: namely, that this remarkable method for depicting space in pictures drew its crucial inspiration from the optical theories of an eleventh-century Arab mathematician named Abū Alī al-Hasan ibn al-Hasan ibn al-Haytham, Latinized as Al-Hazen, whose culture shunned representational art altogether and possibly went about the business of seeing in an entirely different way. Belting’s larger point, of course, is to acknowledge the age-old interdependence of the European and Islamic worlds in a spirit of equality that few of his professors would have shared in the mid-twentieth century. (There were a few scholars who already were making cultural and intellectual connections between the Islamic and Christian worlds, George Sarton and Lynn T. White conspicuous among them, but there were not many.) InFlorence and Baghdad, the connection between East and West has all the excitement of a fresh discovery: in effect, Belting is re-learning, and re-telling, the story of perspective, this time not from Florence for Europeans, but rather on a global scale for a globalized world. “Baghdad,” as he says in his introduction, is a symbolic title: Al-Hazen, his Muslim protagonist, was born in Basra and educated in Baghdad, but he worked and wrote in Cairo. But Baghdad, more than any other Islamic name today, will conjure up thoughts of an ongoing war and current fears about a clash of civilizations, and it is surely these fears, and this divisiveness, that Belting’s study aims in its way to dispel. As with his choice of title, Belting tends to let efforts at contemporary relevance lead him off track. After all, the story of perspective played out over centuries, and, if we count in the ancient Romans, over millennia. Belting has a tendency to mistake his own predilections as universal: when he begins a sentence with “we,” or “the West,” he assumes that his readers share more of his life experience, and his preconceptions, than may actually be the case. Ideally, these mature thoughts about perspective should have had the swiftness and penetration of light, which may, in fact, be the book’s true subject, but instead they tend to run along a crooked path through dense thickets of academic distraction, byways such as Norman Bryson’s criticism, the cinema, and repeated castigation of the evils of colonialism. None of which take us anywhere significantly nearer Florence, Baghdad, or Cairo—or ultimate enlightenment. By now, however, one translator’s unhappy choice in rendering Lacan has become the byword for two generations of English-speaking scholars who would classify themselves as “critical” and “theoretical” while accepting, uncritically and with utter lack of theoretical sophistication, a grossly misleading term for one of their fundamental concepts. Belting’s translator, Deborah Lucas Schneider, cannot be blamed for following suit; many of the book’s readers will identify readily with this terminology, and thus the translation will be speaking a language they understand. And yet Belting, like Lacan before him, is not talking about gazing. He is talking about scrutiny. Perspective is all about paying attention. Indeed, the very structure of Belting’s book hinges on the idea of focused looking. In deliberate alternation, one chapter focuses on the West and the next on the East, with an interlude that he calls a Blickwechsel—an exchange of viewpoints. In German, this is a marvelously suggestive image: the very first chapter emphasizes the way that perspective hangs on—actually mirrors—the spectator’s point of view (Blick), and so we are invited to imagine a person looking out to a picture, sightlines radiating out from eye to painted surface. Suddenly, then, rather than a picture, the viewer’s sightlines hit the sightlines of a person from an entirely different culture—and an entirely different point of view, one in which perspective is not taken for granted. What is this second person seeing? One thing is certain: neither of these people is gazing. Otherwise their eyes would be glazing over. The chief originality of Florence and Baghdad consists in this imagined exchange of viewpoints, in Belting’s having the ingenuity to wonder what and how Al-Hazen must have seen when he discussed what it meant to see—to wonder just how Al-Hazen’s way of defining vision must have struck, and then inspired, fifteenth-century Italians. But an exchange of glances also presupposes, almost by definition, that two people, no matter who or where they are, still share an enormous number of ideas, traits, and habits in common. In the end, Belting’s contrast between Islamic East and Christian West is too starkly drawn, especially in his opening chapter, and too schematic. Fifteenth-century Florence was almost as busy a crossroads between cultures as Venice—or Cairo. But Islamic-style detailing can be found not only on the buildings of Palermo, Syracuse, and Venice, but also in Salerno, Amalfi, and Naples, the great trading cities of southern Italy. In Rome, the lavish thirteenth-century marble pavements produced by the Cosmati brothers are as intricately geometric and resolutely aniconic as the Islamic decorations to which they are related, and like their Islamic cousins, these designs are laden with symbolic meaning: the twelve porphyry and serpentine roundels within the structure called theschola cantorum in the Roman church of San Clemente must stand for the Twelve Apostles, as do the twelve pillars sustaining the pulpit of Salerno Cathedral, and how many more messages we must be missing in these sinuous swirls and patterns of marble roundels. In both the Italian medieval world and the Islamic, there is a direct connection linking these arabesques with the ornate architecture of ancient Rome, which was figurative, decorative, and abstractly geometric all at once. Indeed, Cosmatesque floors literally recycle the colored marbles from ancient Roman pavements. This geometric strain in Italian art persists right into the heart of the Renaissance: those crowning achievements of pontifical Rome, the Sistine Chapel (built 1481, ceiling painted 1508-1512) and Raphael’s Vatican Stanze (1508-1514), combine the most daring in modern perspective schemes with the geometric eddies of brand-new sixteenth-century Cosmatesque floors, executed at the same time that Michelangelo and Raphael were painting the walls and ceilings. East and West are old friends in Italy, as well as old enemies. Florentine architecture may have lacked the decorative Islamic-style merlons we find in Palermo, Syracuse, Naples, Venice, and Salerno, but they appear in nearby Pisa, where the river Arno finally meets the Tyrrhenian Sea. It was a Pisan merchant, Leonardo Fibonacci, who brought Hindu-Arabic numerals to Europe in 1208 with his Liber Abaci, the result of his years as a merchant plying the Algerian coast, and Tuscan merchants therefore led the way in developing the mathematics that can grow once algebraic notation has been invented. Belting assumes that the invention of perspective grew from higher mathematics, but Alberti’s method for setting up a perspective space used no more than the simple tools of Euclidean geometry. Recently the Italian architect and historian Rocco Sinisgalli has associated the invention of perspective with mirrors, noting that Brunelleschi’s first perspectival peep-show, a diorama he set up in the entrance of Florence Cathedral, relied on a mirror to produce its effect. But Sinisgalli traces the preoccupation with perspective and mirrors all the way back to classical antiquity, as have scholars such as John White and many contemporary students of ancient Roman wall painting (keeping in mind always that the place called “Rome” potentially extends from Britain to Nubia to India). There is no question that ancient Roman artists created and manipulated impressions of three-dimensional space in wall painting, inlay work, and mosaic. Sinisgalli goes further, analyzing several pieces of ancient Greek and Latin literature in depth to suggest that perspective existed as a branch of the field known in antiquity as catoptrics, or the science of mirrors. This is the evidence that Belting needs to confront before his own analysis, his causal link of “Baghdad” to Florence, can be fully credible. Instead he asserts—in the course of analyzing Erwin Panofsky’s essay “Perspective as Symbolic Form,” from 1927—that the ancients lacked perspective. Panofsky was of course a marvelous scholar, but his early essay is not evidence about the use of perspective in the way that an ancient Roman painting or the text of Vitruvius is evidence: it is peripheral. Nor will it do to dismiss Rome as “the West,” and every effort to trace original ideas back to classical antiquity as colonialism and Eurocentrism. A great number of ancient Romans came from the continents of Africa and Asia. The real problem for Belting’s argument is this: if the ancient Romans already used perspective, then Al-Hazen’s medieval studies of optics cannot have been essential to its invention, and Islamic science might be robbed of the seminal role he reserves for it in the development of Italian Renaissance art. AL-HAZEN HIMSELF would not have seen the problem in the same way. He and his fellow Arab mathematicians did not invent algebra out of whole cloth any more than Brunelleschi invented perspective in a vacuum. All these inventions occurred to people who thought and read and worked, like Newton after them, on the shoulders of giants. The Arab mathematicians read the Greek philosophers eagerly, without worrying about Eurocentrism or colonialism or barriers of language. Both Islam and Christianity have such an intricately developed imagery of light because both bear the profound imprint of Plato—an acknowledgement of whose commanding presence is sorely missed in Belting’s analysis. Ultimately, however, even if the ancients had perspective, they used it differently from the artists and the mathematicians of fifteenth-century Italy, and that difference is conditioned by the experience of Arab mathematicians in the Middle Ages. Belting is working with up-to-date sources on the Islamic side (though he seems occasionally to forget that “Islamic” and “Arab” are not synonymous), but his information on the ancient classical world, presumably because of a certain reflexive antipathy to “the West,” all too often falls back on received wisdom—that is, on misinformation. Alberti did not complain that the ancient architectural writer Vitruvius was a bad writer, as Belting suggests. His complaint was much more specific. Vitruvius wrote his Ten Books on Architecture in a combination of Greek and Latin because his readers were all bilingual, but the medieval scribes who copied the text in subsequent centuries no longer had that flexibility and gradually made an unintelligible hash of the Greek. Alberti really said that Vitruvius was illegible, and he was right. Modern knowledge of ancient Roman wall painting did not begin, as Belting asserts, with the excavations of Pompeii—graffiti prove that artists were trooping through the painted ruins of Nero’s Golden House by the 1470s, and there is good evidence that fifteenth-century painters such as Botticelli knew Etruscan art as well as Roman art, and at least sometimes could distinguish between the two. In many respects, the classical world still surrounded the people of the Italian Renaissance. Late Antique paintings certainly survived into the transitional period between thirteenth and fourteenth centuries in Italy that produced not only Giotto, credited with inventing modern painting by his fellow Tuscan, the sixteenth-century biographer Giorgio Vasari, but also the less heralded and equally pioneering Roman painters Jacopo Torriti and Pietro Cavallini, not to mention those champions of aniconic, geometric design, the Cosmati family of stonecutters. Rather than cut out antiquity from the flow of history and divide Islamic “East” from Christian “West,” Belting could have made his arguments by noting the continuous millennial contact between these Mediterranean lands, placing Al-Hazen and Brunelleschi into a never-ending story of give and take that began in prehistoric times—abundantly attested to archaeologically—and continues today. Like Samuel Edgerton, who has spent much of his career exploring fifteenth-century perspective, Belting believes that Brunelleschi’s particular means of rendering space has had massive repercussions in European culture at large. Edgerton regards the fruits of perspective as largely benevolent: an increasing focus on human dignity; the development of science. Belting is less sanguine. In part, this difference of emphasis must reflect nationality. Edgerton is American; Belting is a German who took his doctorate in a Mainz that was still badly scarred by World War II, reason enough to spend significant amounts of time contemplating the follies of European power lust. In this penitent spirit he traces colonialism back to the invention of perspective, bringing in a Peter Greenaway movie called The Baby of Mâcon to emphasize his point. But the scene of two hundred bowling pins with mechanical eyes trained on a canopied bed “where scenes of violence occur” is not going to simplify any argument, especially a treacherous post hoc, propter hoc argument. A fixed viewpoint seems a bit slim as a premise for a ravenous hegemonic impulse, given that the Chinese “Middle Kingdom” managed to be more than a little ravenous and self-centered on a flat foursquare grid, and the same link between ravening and self-centeredness could be argued, with a little ingenuity, for Genghis Khan’s cosmic tree or the thoroughly Islamic Ottoman Empire. What begins to make perspective dangerous in Europe, and does have a definite relationship with the development of European colonialism, is its alliance with ballistics in the sixteenth century, over a Chinese invention called gunpowder. Victor Davis Hanson has argued that Western dominance has largely been a matter of Western methods of warfare, an explanation that has the advantage of limpid, if sobering, simplicity. Belting’s study outlines a far more benevolent story of cultural exchange (rather than dominance), and provides a glorious, if episodic, meditation on one of the Mediterranean region’s greatest assets: light, in all its power and glory, both real and symbolic. Here, as in his discussion of perspective itself, forging a closer connection between the ancient and Islamic worlds, as he does between Islam and Italy, would only strengthen his essential message: that human knowledge, and the human will to beauty, knows no boundaries of time, space, or culture. Ingrid D. Rowland is based in Rome at the University of Notre Dame School of Architecture. She is the author, most recently, of Giordano Bruno: Philosopher/Heretic (Farrar, Straus and Giroux). This article originally appeared in the December 29, 2011, issue of the magazine.